Before you buy you your next lip balm, turn the package over and read the ingredients list. If you see something called hyaluronic acid included, snap it up: this product is bound to deliver juicy lips. That’s because hyaluronic acid is a seemingly miracle ingredient that attracts water, naturally plumping your pucker. Luckily, these products do exist! Here, we rounded up five HA-infused lip balm and serum that deliver visible results. The IT Cosmetics© Je Ne Sais Quoi Lip Serum ($24) is the type of lip treatment that doesn’t feel like you’re wearing one. The light pink serum leaves the slightest flush on your pout, while nourishing your pucker with antioxidants and essential butters. Try it as a barely-there, just-bitten look or under your favorite lipstick as a pre-party treatment. The SkinMedica®HA5® Smooth and Plump Lip System ($68) allows you to pamper not just your lips, but the area around it with HA. The first step helps smooth and hydrate lips, while step two enhances rosiness and contours. Expect instant looking plumpness, a visibly rosier color, and visibly smoothed-out fine lines. Pretend it’s a facial just for your lips! This dual-chamber serum from the late Dr. Brandt’s line features Hyaluronic Filling Spheres™ — another plumping form of HA. 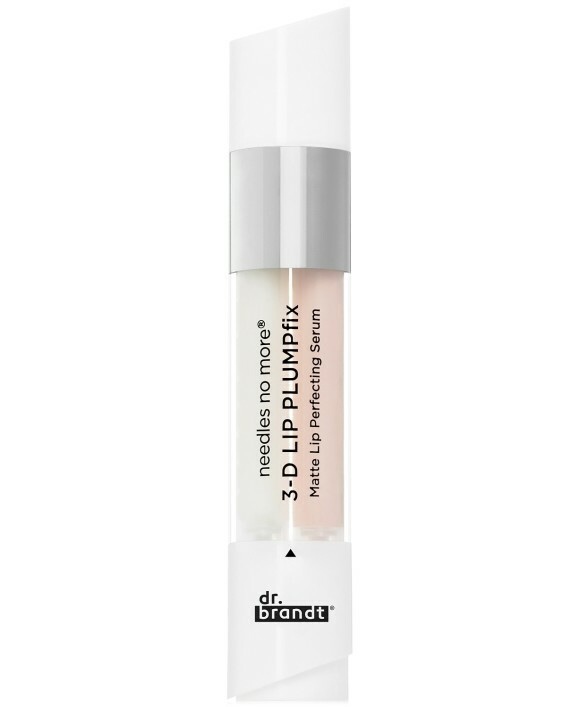 Use the Dr. Brandt® Needles No More 3-D Lip PlumpFix ($39) as you would skincare: prime and prep with the serum and layer on color. If you use it over time, you’ll likely improve the quality, contour, and fullness of your lips. That’s all thanks to a long list of ingredients including peptides, shea butter, and a medley of oils (coconut, macadamia, grape seed, pomace olive, jojoba, and sunflower). The water-retaining Murad® Rapid Collagen Infusion For Lips ($24) can be used throughout the day — but you may not need to thanks to hydrating HA and shea butter. The serum also contains collagen to smooth out vertical fine lines and mustard sprout (yup!) to make your lips appear plush. If you are “cleaning” up your beauty routine — eliminating sulfates, parabens, and other “bad stuff,” try the Naturally Serious© Lip Service 3-in-1 Lip Serum ($16). The formula contains naturally hydrating ingredients like HA (of course), squalane, jojoba seed oil, and shea butter. It’s also antioxidant packed — including pomegranate, goji berry, grape seed, green tea, red tea, and white tea — which help protect lips against pollution and free radicals.